Roku Device Setup, Don’t Fall for the Scam! If you are anything like the rest of the world, you have way too many things to do in too little time, and don’t get anywhere near the amount of sleep that you need. One quick fix for this issue is coffee, but plain black coffee can get old after too long. While there are tons of different recipes you can use, espresso is a great option if you are on the run, and need an extra energy boost for the day. With this product review, you can find a great espresso machine for a reasonable price so you can switch up your daily routine, while getting the energy you need to conquer the day. *Price typically updated every 24 hours. Current price may be different. While as much as we would like to be able to run on an IV drip of coffee every day, it is simply not feasible. However, with a great espresso machine you may be able to beat the morning blues with an amazing surge of energy from a tiny cup of coffee. Espresso, in its pure form, is generally much more popular in European countries than in the United States, and is best known in Italy. In the past decade or so, the espresso craze has been catching on, and we are able to find significantly more espresso machines than ever before. Don’t worry if you have the misconception that espresso is a dark, bitter taste that can be compared to burnt-flavored roast of coffee. Of course, if it is poorly made, this may very well be the case. However, if it is properly brewed, and made specifically to your liking at home, it may be the best thing to ever happen to you. When using these machines, it is mainly the method of making that coffee rather than the coffee itself that earns it the title of espresso. There is a finely ground coffee that is blended from several different roasts to form a more bitter flavor. This is the main idea behind espresso. When the high-pressure water is forced through these fine grounds, the flavor is extracted in smaller concentrated amounts. This is why it has a much more intense flavor, and is typically referred to as an espresso shot. 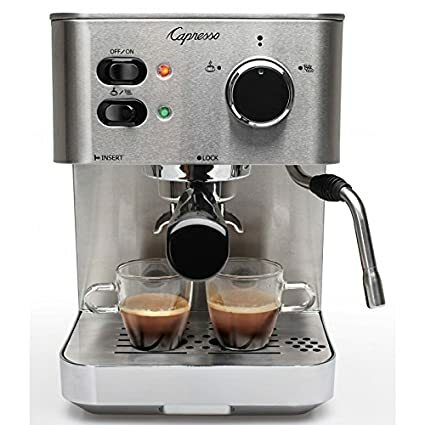 Now that you know a bit about what exactly espresso is, and how the machine works, we can review this first espresso machine that is sure to please. One of the primary things that comes to mind when you see this machine is that it looks impressive. It is almost a tad bit intimidating looking at all the different knobs and handles and trying to figure out how to work it. However, this is a simple model despite its appearance, and has a one touch control panel for a single or a double shot options. 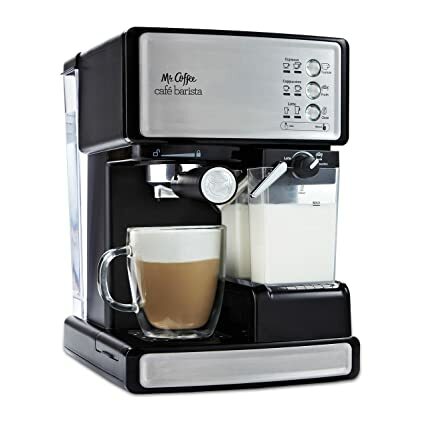 One of the many wonderful things about this machine is that not only will it make an espresso for you, but it can also supply you with unlimited amounts of cappuccinos or lattes made exactly to your liking. The product description states that this machine is easy enough for anyone in the house to use, however it is highly recommended that it is stored away from the reach of children as the liquids produced from the machine are extremely hot and have the potential to cause burns. This semi-automatic machine has a 15 bar pump system that is sure to please. The amount of bars an espresso machine can produce is an indication of how pressurized the water coming out into the coffee grounds is. The higher the pressure of the water, the more flavor it can extract from the grounds. Since most of these products start at a 9 bar pump system, this is definitely a great machine with even better water pressure. 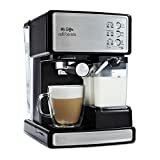 If you are still a little turned off by the many levers and switches, keep in mind that this model in particular comes with an automatic milk frother that will completely take the guesswork out of frothing your milk. Simply pour in your choice of milk, press a button, and you have a beautiful cappuccino. There is also a one touch button so you can choose between an espresso, late and cappuccino every morning. There is a large reservoir in the back of the espresso maker that is hidden out of sight. With this reservoir, you can store a hefty amount of water so you do not have to fill the tank every time you make coffee. This is quite a convenient option. Since one touch buttons are the name of the game with this Mr. Coffee, you can also make the choice between a single and double serving of whatever drink you choose. It’s a wonderful option when your kids kept you up way later last night than you planned on. When it comes time to actually make your drink, all you have to do is choose between a single shot or double shot of the drink of your choice, select your pre-ground grounds, and fill the milk reservoir. The grounds container can also double as a handy scoop so you don’t have to bury your hand down in the coffee bag every morning to try and fish out your spoon. The first time you use this machine, all you have to do is plug it in and double check that the On/Off switch is on the off position. It is necessary to prime the unit prior to putting any milk and grounds inside of it by running water through and completing one cycle. Once this is done, you can enjoy lattes, cappuccinos and espressos for years to come. The next contender on our list looks just as complicated as our first option, however amazingly enough it is also just as simple to use and operate. This one may be the best contender on our list looks wise. The entire design of this espresso machine is sleek and stunning clad in an all over stainless steel exterior. Not only is the outside simply stunning with stainless steel, but a major portion of the inside is coated as well in an attempt to keep it clean and bacteria free. This product alone is the Top Seller according to one of the internet’s best coffee machine reviewer’s website. 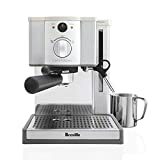 He mentions that as a professional espresso machine reviewer, he has come across hundreds of different machines that have claimed to be the best one out there on the market. However, with this model, he believes he may have found the holy grail of coffee makers. As with the model above, this also has a powerful 15 bar thermos block pump so the Mr. Coffee has quite a run for his money. Equally as powerful, it guarantees you a hot strong cup of coffee every morning when you wake up. This model also has a dual-wall filter system to ensure that you have no grounds in your coffee, and excellent cream to add to that. The froth enhancer alone may be a deal breaker for some. The froth that this machine is able to produce is unlike anything seen on other models and gives you one of the frothiest cups you have ever encounter. However, if you look forward to our pre-purchase considerations, this may not be something you enjoy. Another thing to keep in mind is that this does not have a removable water tank for easy refilling like the previous option. While this may be a factor of convenience rather than a make or break deal for the machine, it is definitely easier to bring the tank to the sink as opposed to bringing the sink to the tank. To make up for the fact that it isn’t removable, it will indicate when the tank is low with a small flashing light. The tank itself is pretty large and can hold 1-2/7 quarts of water so it doesn’t need constant refilling. While it does lack a removable water tank, you can remove the drip tray and the grid for exceptionally easy cleaning. Simply take it out and throw it in the dishwasher whenever it needs a good scrubbing. Counter space is always an important thing to keep in mind, especially when you don’t have a lot of it. This handy machine is truly a great dual espresso and cappuccino machine that is sure to please. Overall, each one of the choices in this list would be a wonderful addition to your home, and will guarantee you your daily does of caffeinated happiness. This can technically be called short and small, which is great for your counter space, but it is definitely not short on essentials or quality. There are so many features this pro espresso machine comes with, it truly will give all of the other options on this list a run for their money, and will be great if you choose to bring this commercial grade machine home. With a 15 bar pump system is has the exact same amount of water pressure that the previous two models had. The powerful frother attached to the machine will create one of the creamiest and foam heavy milk based drinks you have ever tasted with its impressive power. In addition to these wonderful features, there is also a removable water tank so you don’t have to continually bring over cups of water to refill it whenever you want coffee. Simply bring the entire tank over to the faucet and fill it up prior to use. It is recommended that you clean the tank every so often, and only require a good scrubbing in the sink. Due to its awkward shape, it is not recommended that you put it in the dishwasher. The tank also has a 42 ounce capacity to prevent continuous refilling when you are in the mood for coffee. 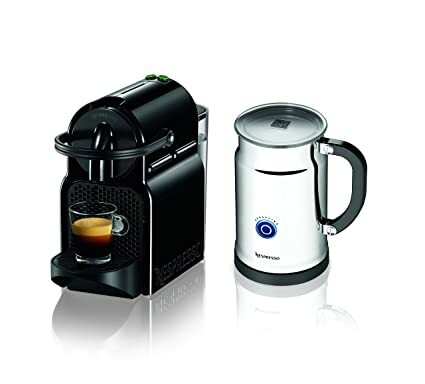 There are two different espresso filters included on this model, one is for convenience and the other one is for control. Interestingly enough, the double spout shown on this model will create an absolutely optimal brew that is both quick and easy. If you and your partner argue over who gets to make the first espresso in the morning, fear no more as with this machine you can make one or two different espressos at the exact same time. Complete with a handy dial on the front, it is extremely simple to choose whether you want to make a cappuccino or an espresso. All you have to do is turn the dial to your beverage of choice and within minutes it will be warming your hands. The heavy duty stainless steel construction also lands to the integrity of the espresso machine so you don’t have to worry about it breaking down or getting rusty on you. This once again makes it much easier for you to clean and maintain as well. One of my favorite features on this model is that it has an integrated and built in cup warmer. This means that if you make yourself a delicious and hot cup of coffee in the morning and got distracted before you could drink it, this will keep it nice and warm until you remember. Also, if you preheat the machine, it will warm up your cups prior to when the drink is poured in to keep it extra warm. Last but definitely not least on our list is the Nepresso Inissa machine. This is a thin sleek design makes this espresso maker look much pricer than it is, an impressive feat considering that this is our budget pick for the review. Overall this is a wonderful machine that is sure to please and will do just that. The price includes an Aeroccino Plus milk frother for easy and heavy frothing. This item alone would cost you approximately $72 is you chose to purchase this separately for another machine on this list. The milk frother has a maximum capacity of 130 ml for milk froth preparation and 250 ml for hot milk preparation. With this, it only takes 70 seconds to get hot milk froth ready to go. With a detachable base, it is super easy to clean. Composed of stainless steel, it is a highly functional addition to any kitchen, and works especially well with the Nepresso espresso machine. Like a Keurig uses K-Cups, this model has the ability to use Nepresso Coffee Capsules for easy and quick coffee, as well as little to no clean up. They are made similarly to k-cups and come in a variety of different flavors you can choose from. This will quickly heat up and get ready to make you a delicious cup of coffee in no time. Simply flip the switch and almost instantaneously it is ready to brew you a delicious cup of coffee. With a 9.1 inch height this may be the smallest machine on our list. It only weighs 5.29 pounds will take up hardly any room on your kitchen counter. This compact size may be the deciding factor to many reading this review. Additionally, it comes with an ergonomic handle to make it as comfortable as possible for you to make your delicious coffee. It also comes with the highest 19-bar pressure around so you will definitely get a strong cup of coffee. The removable water tank in the back once again adds extra efficiency and ease to your operation by allowing you to bring the tank to the sink. In addition to a removable water tank feature, this machine also has an energy saving mode that will automatically switch the machine off after 9 minutes of non-use. With this, you no longer have to worry about forgetting to turn the machine off before you leave, or getting halfway through your morning commute before realizing you completely forgot to turn something off. How frothy do you like it? The common saying “to each his own,” has ground in pretty much any conversation topic, and is absolutely no different here. Coffee is one of life’s greatest pleasures, and because there are so many different types of coffee available to us, we can be very picky about how we enjoy our coffee. Some of us prefer it plain, some prefer it with frothy milk. It’s okay to be choosey because each of these options have a variety of different features that will allow you to make your own choice. Based on the milk frothing capabilities of these machines, you can choose exactly which one you would prefer to own. Do you want a multifunction machine? Espressos are delicious. There is absolutely no way to deny that. However switching up your drink once in a while is a great way to start your morning. A couple of these machines are multi-function and can also create cappuccinos or lattes to your liking. If you are only interested in making espressos, then you don’t need to be too concerned with looking for the machines that have a dual function. However if you are interested in as do it all machine to make a variety of drinks, this review does include options you would enjoy. How much counter space do you have? When you have a small amount of space, whatever you have left over is sacred and is to be used wisely. However in circumstances where you have a ton of space to work with, it is less important to use each square inch to its fullest. Each of the machines above have a variety of different sizes ranging from what will take up a fair amount of your kitchen counter space, to what will be barely noticeable when it’s out. Don’t worry though, just because its smaller doesn’t mean that you will be sacrificing quality for lesser quantity. How strong do you enjoy your coffee? As with how much froth you like on your coffee, how strong you like your coffee is a major factor in your drinks as well. These machines have a measurement for how strong your average coffee will be based on the bar pressure. A majority of the machines on this list have a 15 bar pressure, which in the consideration of everything is a pretty strong cup of coffee. Espresso Machines generally start at 9 bar pressure, so 15 would be great if you like a strong, yet mild cup of coffee. There is also a 19 bar pressure on this list for an extra strong cup of coffee. Overall it just depends on what you prefer. All in all, each of these budget conscious espresso machines on this list would be a wonderful addition to your home for under $200. Based on the pre-purchase considerations, your own personal preferences, and a variety of other factors, you can get a great machine for an even better price in no time. We take pride in our recommendations. We only choose products we think will benefit the majority of buyers. TheSmartConsumer.com is a participant in the Amazon Services LLC Associates Program, an affiliate advertising program designed to provide a means for sites to earn advertising fees by advertising and linking to amazon.com. The Smart Consumer strives to provide accurate pricing whenever possible. For most products we utilize Amazon's Product Advertising API which automatically pulls live pricing data from product listings. Use our pricing data for reference only. In order for our team to continue providing their time writing unbiased product analysis, reviews, and comparisons we use affiliate links . Be aware that when you utilize a link from our site it may result in a commission for us if you choose to make a purchase. These links come at no additional cost to you and do not change the price of the products on the destination website. For more information read more about us and how we operate our site. We try to suggest only products we think people like you would love to own. Have feedback? E-mail us anytime at [email protected]. We hope we've helped you find an awesome product that makes your life better.